Erich Schiffmann is an American yoga master who has been called one of the innovators of modern day yoga. When this series came out in 2015 he had been teaching for 42 years and practicing for 48 years. His primary teachers include Krishnamurti, Desikachar, and Iyengar. 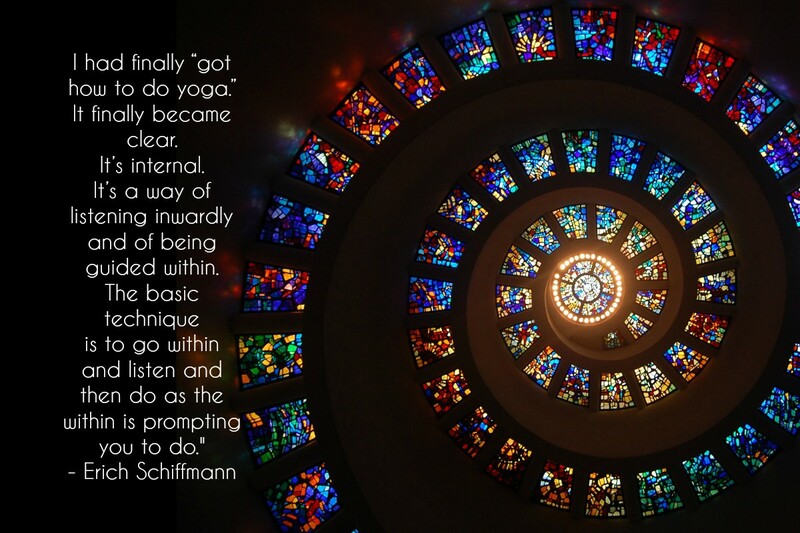 Schiffmann is one of my yoga teacher’s teachers and his book “Yoga: The Spirit and Practice of Moving into Stillness” is a personal favorite. I’ve never studied with Schiffmann so you can imagine my excitement when I saw a coupon code on his Facebook page for a 30 day free trial of Yoga Anytime. I jumped at the opportunity and signed up for his five day immersion. It took me three weeks to complete the seventeen hour course. The immersion was divided into philosophy discussions, guided meditation and asana practices, as well as Schiffmann’s signature Freedom Yoga practice. I skipped the silent Freedom Yoga sections and just observed the first couple of asana practices (videos are not my favorite learning style for asana). My favorite part was the guided meditations. Schiffmann is an expert meditation teacher. He understands that meditation is the main practice of yoga, and that meditation is what promotes and facilitates the realization of what yoga is about. Some of the meditations were absolutely delicious. I enjoyed his directions to “snuggle” parts of my body into the mat and to “squeegee myself clean” when doing body scans. Schiffmann emphasizes the idea that yoga is a lifestyle – that it is so much more than “metaphysical P.E.” (love this!) Regarding the asana portion, I appreciated his preference for the “simple stuff.” He describes the asana practice as being very easy although the mindset is very advanced. The sequences are effective at opening the channels (nadis) in a gentle way that is suitable for all levels. I enjoyed his stories about his yoga journey. He described a turning point of when he felt like he was always doing someone else’s yoga. After years of disciplined practice he said that his yoga felt like a dud. It was only when he learned how to channel lines of energy through his body that he became empowered with his own practice. This marked the beginning of Freedom Yoga. Schiffmann is an advocate of learning how to channel our own practices. He recommends beginning with systems of your choice. The discipline of learning established systems is important as it helps to “get you in the game,” but being dependent on a teacher is kind of a drag. Once you’re trained the practice begins to teach you and that’s when it becomes fun again. Otherwise it can feel like you’re stifling yourself. As you dive deep and allow free form movement to occur eventually it will flower as an intuitive practice. Stay tuned for Freedom Yoga Immersion Part II.